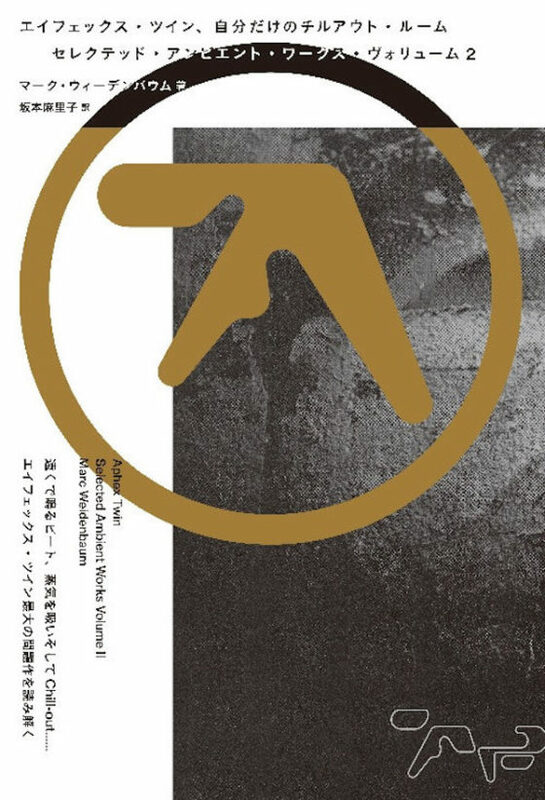 I do believe this may be the cover of the upcoming Japanese translation of my 33 1/3 book on Aphex Twin’s landmark album Selected Ambient Works Volume II. Having spent much of the early 2000s working in manga, which is to say helping shepherd the translation into English of Japanese books, I’d say it’s nice to finally be sending a book back in the opposite direction. ✚ “Mend,” the closing track from Care, the new album from Klara Lewis and Simon Fisher Turner on Editions Mego: editionsmego.com, soundcloud.com/editionsmego. ✚ “Through the City,” the track by Marcus Fischer on the new Field Works collaborative album, Pogue’s Run: fieldworks.bandcamp.com. ✚ “Is a Rose Petal of the Dying Crimson Light” off the new Tim Hecker album, Konoyo, on the Kranky label: timhecker.bandcamp.com. 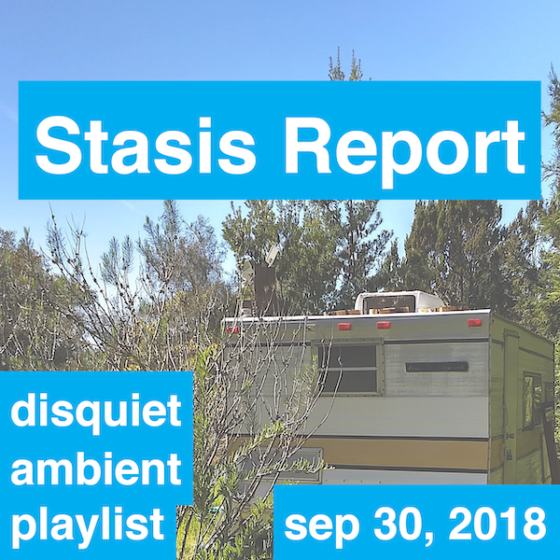 Some previous Stasis Report tracks were removed to make room for these, keeping the playlist length to roughly two hours. Those retired tracks (by Anna Meredith, Robert Rich, Olafur Arnalds, Simon Stalenhag, Mary Lattimore, Ellen Arkbro, Mark Van Hoen) are now in the Stasis Archives playlist (currently only on Spotify). The Assignment: Make very quiet music for very late at night for very fragile psyches. Deadline: This project’s deadline is Monday, September 17, 2018, at 11:59pm (that is, just before midnight) wherever you are on. It was posted just before noon, California time, on Thursday, September 13, 2018. Step 1: It’s the middle of the night, long past dusk and long before dawn. You can’t sleep. Step 2: Think about what kind of music you’d want to hear right now — super quiet, super subtle, unlikely to wake you, potentially to ease you back to the comfort of your pillow, or at least to calm your mind. Step 3: Record the sort of music that Step 2 made you imagine. 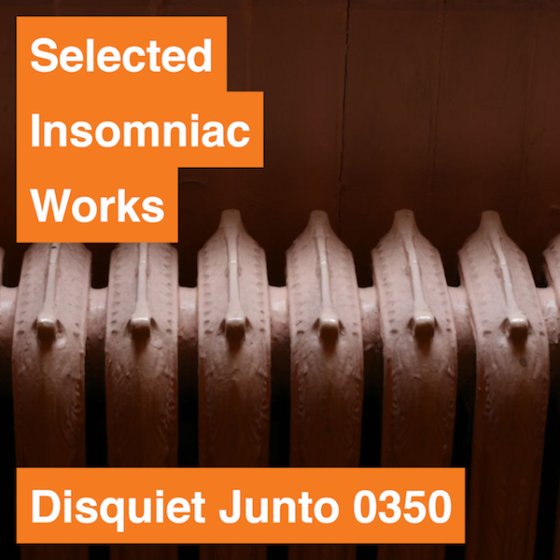 Step 1: Include “disquiet0350” (no spaces or quotation marks) in the name of your track. Step 2: If your audio-hosting platform allows for tags, be sure to also include the project tag “disquiet0350” (no spaces or quotation marks). If you’re posting on SoundCloud in particular, this is essential to subsequent location of tracks for the creation a project playlist. Title/Tag: When posting your track, please include “disquiet0350” in the title of the track, and where applicable (on SoundCloud, for example) as a tag. The wind chime is, by most accounts, the original “generative” instrument: it is the original device that serves dual essential purposes, as composition and as tool. That’s particularly satisfying, as the wind chime is to me, in terms of both the SAW2 track on which it manifests and the instrument itself, a deep well: as a music-making device; as a proto-ambient, pre-electric technology; as a cultural touchstone; as a unique sound unto itself; and as a metaphor and enactment of generative art, among many other things. The majority of the record is of a piece with Evening Star, the collaboration between Brian Eno and Robert Fripp that dates from 1975, Eno’s great year — the same year he released Another Green World and Discreet Music. Thomas Tallis’ Spem in Alium, which he explained he first heard in the sound art project by Janet Cardiff, who set up 40 speakers to invoke an immersive environment, allowing the listener to navigate the choir as a ghost or a character in The Matrix might. And he recommended Richie Hawtin’s prolific Plastikman moniker. The intervals between notes bring to mind “Silent Night,” which puts this solidly in the realm of Unsilent Night, composer Phil Kline’s secular year-end music, which manages to be reflective and seasonal without having a sectarian, devout, or otherwise irreconcilably spiritual affect. A good number of the highlighted entries seem to focus on subsequent listening. Hassell introduced the term “Fourth World music” to this sort of endeavor. It is future music, music from a time and place where rituals are brought to bear through unintended uses of new technologies, especially of castaway materials. Jon Hassell’s music was on a list of potential subjects when I was pondering what album to pitch to 33 1/3. Having failed in a previous round, when I proposed to write about the debut album from the Latin Playboys, I had aimed this time around to push for a more commercially successful and more broadly culturally active subject. Had I not, something by Hassell may very well have made the final cut, and it’s nice to know that he surfaced as a point of interest for readers. Raves were less concerts than what has become fashionable to term temporary autonomous zones, and this was especially true in the era before the predominance of the cellphone, when the autonomous aspect had as much to do with being cut off from the world as it did with being part of a self-organizing civic space built with its own internal rules. Raves were dark, murkily architected, often expansive spaces in which sensory overload and disorientation was a common goal. One could as easily lose touch with one’s friends as with oneself. Ambient music defines the space in which it is heard, in part simply by making demands on that space, that it be conducive to quietness. Raves are often quite a contrast to ambient, but as sonic environments they have much in common with it. [I]t has been proposed that Selected Ambient Works Volume II on CD is intended for both sides to be played at the same time, that the track breaks align, and that parallels are self-evident, each side enhancing the other, a jigsaw puzzle with just two very long complementarily individuated pieces. It’s good to know the old myths still have life in them. The music of Aphex Twin works effectively in the film precisely because it need not come across like music. It sounds like neighboring power stations and internal anxiety. The film in question is Devil’s Playground, the 2002 documentary by Lucy Walker about Amish rumspringa, a teenage rite of passage. Aphex Twin is frequently quoted as having likened the album to “standing in a power station on acid.” In the able hands of Walker, herself an illbient musician before becoming a filmmaker, that acid experience is slowed down to the emotional turmoil of rumspringa’s most fragile participants. And that covers it. Perhaps there will be other frequently highlighted passages as the years pass. The overarching theme of my book is what came of the album after it was released, what listeners, and technology, and other artists did with it, changed how we heard it, even those of us — like me — who heard it when it was first released, before all the anecdotes and myths and knowledge had accumulated around it. It’s nice as my little book now itself gets older to see what bits have stuck. And if you’re interested in reading more about the book before picking it up, I recommend the interview that Mark Richardson did with me at Pitchfork shortly after the book was released. Aphex Twin recently debuted his own online shop, where he’s making available not only high-fidelity audio of past releases, but also candid insights into those recordings. The site is at aphextwin.warp.net. It’s been slowly accumulating his Warp releases, and even music from his own label, Rephlex. The store includes not only recordings released by Richard D. James under the name Aphex Twin, but also under such monikers as GAK, afx, Polygon Window, and the Tuss. And the releases aren’t merely archival. Included is an expanded version of the recent collection of experiments with the Korg Minilogue synth, on whose development James consulted. In addition to the tracks themselves, streamable online and available for purchased download, there are occasional bits of information. Some of them are simply humorous (a demo for a Japanese extra on 1999’s Windowlicker is tagged “You should not drink and take Antibiotics”), and others more informative, or at least semi-informative (an extra track on 2014’s Syro is tagged “Missing track from Syro, didn’t make it for technical and personal reasons. Drums were made on FOUR customised mid-racked Pearl syncussions, thanks to Colin Fraser and Tony Allgood”). The site has a mix of certitude and silliness that feels like Richard D. James’ hallmark. For individual tracks you don’t click on a “purchase” or “buy” link, for example; instead you click on a link that reads “Cherish.” On each page, there’s a different joke term for whether you buy the “lossless” or more standard 320 mbps version of an album (these include “No guilty conscience,” “Possess,” “Nab,” “Casket,” and “Part with money,” among others). The audience for this information is often musicians more than just Aphex Twin listeners. A video was added for the Drukqs track “Vordhosbn,” showing its underlying software in action (the goings-on are detailed by David Abravanelat at cdm.link). The site didn’t launch fully formed. There was initially a mention that Rephlex releases would show up, and eventually some began to. And it doesn’t appear simply to be a matter of accrual. Things are changing as well. When the site first launched there were little colorful tags next to the new tracks that were being added to various albums. Those extra tracks remain, but the icon callouts are gone. This track has now thankfully been found and uploaded here, I was very worried it had been lost, very relieved*** It was not included on the original CD’s as there wasn’t enough room. I usually always give priority to the vinyl versions of all my releases as I never ever really liked CD’s much, think I would have liked CD’s a little bit more if you could put 90 mins on them, who decided they were to be 74 mins anyway? Thinking about this now I’d love to try and get Warp to do high quality chrome cassette versions of all my Warp musics, maybe even metal ones if possible. If I wait a year or so for this I could include all the extras on the cassettes as there would be plenty of room, would have to sign the tracks over to Warp first for a physical release, something I don’t have to do for this website but that shouldn’t be too difficult. Someone I used to know, you know who you are, worked as a cleaner in a police station and kindly pinched me a police interview tape. It was with a woman who murdered her husband, it’s the background audio in this track. featuring an EMS synthi ‘a’, mk1, Studiomaster star mixer, recorded 184 Southgate road, 1st floor, London. Bought the synthi when I was about 19 from Robin wood at ems, Ladock, Cornwall. Saved all my money for it for a long time, one of the first synths I ever bought and I know that machine inside and out, magical piece of equipment, always felt like it was made specially for me. Visit the Aphex Twin site at aphextwin.warp.net.